The Musser M500 Concert Grand Soloist is highly regarded for its classic design and masterful, rich tone in the note range of C2-C7. 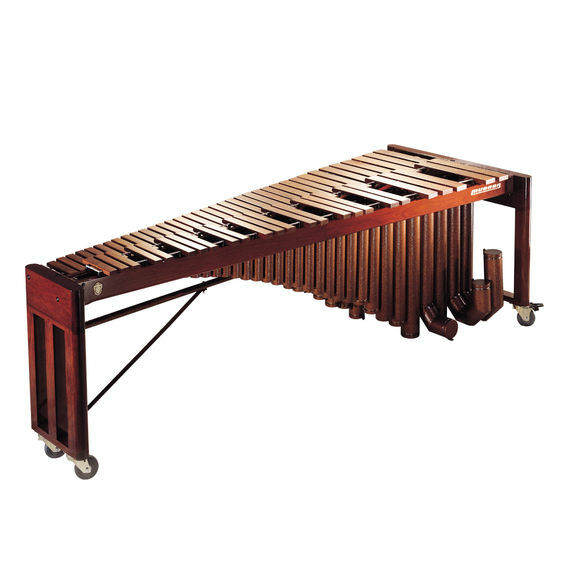 A choice among professional recitalists for its presentation and tone, the 5-octave marimba features beautiful rosewood bars with rounded accidentals. The select wide-graduated rosewood bars provide a rich, full tone. Light staining, hand rubbing and a clear finish on the bars accentuate the beauty of the rosewood. With a furniture quality hardwood frame and copper vein powder coated resonators, the M500 Concert Grand Soloist marimba is a stunningly handsome instrument. Musser's most technically advanced marimba creation, the M500 Concert Grand Soloist features tunable aluminum alloy resonators secured by bolts and lock-nuts. Fine tuning a marimba allows the player to customize sound within the limitations of acoustics, temperature and humidity. With the Musser patented resonator caps, tuning in the range of C2 to C3 is quick and accurate, even in the lowest register. Resonators feature two position settings for placement. Masterfully designed for the concert performer, the entire instrument disassembles for transport. The frame is height adjustable from 33.5" to 38", with durable locking casters for smooth transport and durability. Folding resonators and rails and detachable end pieces pack securely. Wide bars is one thing, but then to space them 3/4" apart? Octaves in the low register are pretty much impossible. The bars are mounted too close to the rail, and will slap easily. The bars on the low end are way too thin and crack easily. You can not get any power out of this instrument at all. It sounds great at mezzo piano, though. The height adjustment is also a pain. It requires a special tool, and if you lose it, things get challenging. Quite an exaggerated description, overpriced, and nothing like it was described. Notes were out of tune and were badly strung. Not portable at all. PLEASE BE ADVISED THAT THERE ARE HUNDREDS OF BETTER FIVE OCTAVE MARIMBAS OUT THERE. I love this marimba. We had 4 of them in high school, and they are the most beautiful sounding instrument I've heard in the percussion world. Great buy. Highly recommend. The instrument that I received Musser was nothing Like that description. There were numerous bars out of tune with the instrument. The frame had so many issues. The resonator support system was good, but it does not retain the shape that the picture does. The wheels on this instrument really made it possible to move a 400 lb instrument from room to room. Please be advised: Do not buy this instrument. It is a horrible instrument. There are much better options out there at a much more reasonable cost.